Designed to monitor pressure of PendoTECH’s Single Use Pressure Sensors™, the PressureMAT™ Sensor Monitor combines monitor, alarm and transmitter in one unit. Featuring an easy-to-read LCD screen that displays the pressure readings, the PressureMAT is ideal for monitoring pressures for filtration, bioreactor, and chromatography applications. 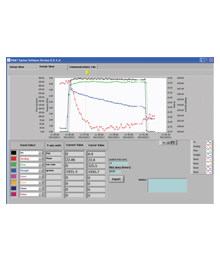 The monitor’s data output capability enables the readings to be routed to a PC or control system for data collection. For low-pressure applications, PendoTECH offers a High Resolution (HR) model that achieves ten times the precision of the standard PressureMAT unit. By enabling users to set pressure limits, the PressureMAT’s alarm settings help safeguard the integrity of your specialized process. Also available are the PressureMAT Sensor Transmitter, the handheld PressureMAT DPG sensor reader and the PressureMAT PC Data Acquisition Software. The PressureMAT™ is a monitor, alarm, and transmitter unit designed for use with the PendoTECH Single Use Pressure Sensors. This lightweight, portable unit can easily be moved around a lab or pilot plant to the location where pressure measurement is required. The monitors use state of the art, solid state electronics, which require no calibration or maintenance. The output options, simplify integration to PCs or higher level control systems and a relay switch enables interfacing with pumps and valves. Options include models with up to four pressure sensor inputs. The PMAT3 and PMAT4 model can optionally display Delta-Pressure of P1-P2 or trans-membrane pressure (TMP) for filtration processes. These calculated values can also have alarm set-points and the values can be transmitted. 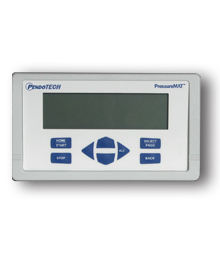 Monitor – the process pressure is displayed on the LCD display with a range of -7 to 75 psi. Pressure can also be displayed in bars. The PMAT3 and PMAT4 models can optionally display Delta-pressure of P1-P2 or the trans-membrane pressure (TMP). These calculated values can also have alarm set points and can be transmitted. The PMAT-S Single Channel Unit is available as a High Resolution (HR) model for low pressure applications that achieve 10x the accuracy of the standard unit. Alarm – minimum and maximum pressures are entered on the key pad and if the process pressure goes below the minimum setting or above the maximum setting, the system will go into alarm state. The alarm state that may be tied to the relay output help safeguard the integrity of a process. Transmitter – the transmitter function delivers a 4–20 milliamp output signal corresponding to the pressure reading on the display. This system is useful for input to a process control system. Also available is a RS232 data output to a PC and there is Customized Data Acquisition Software that can collect all of the data from the unit, as well as data from one scale [SOFTWARE DEMO].There is optional internal data logging. There are numerous applications in biopharmaceutical production processes where the system can be used to monitor pressure such as filtration, chromatography, and bioreactor pressure monitoring and control. 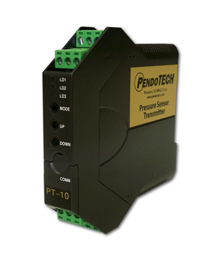 The PendoTECH Pressure Sensor Transmitter connects to the PendoTECH Pressure sensor and produces a 4-20 milliamp signal that is linear with pressure. It has a convenient DIN rail mounting design. Multiple options are available to deliver optimal performance based on pressure range. For low-pressure applications, there is a transmitter device with a 4-20 mA range of either 0-2 or 0-10 psi. For higher pressure, there is a transmitter with a range of 0-30 psi. Better accuracy and repeatability is achieved by selecting the narrowest range that meets the application requirements.